Your level of intensity is high in the eighth house as Scorpio is your ruling star sign, and Pluto only makes you more passionate about everything in life. You’re interested in anything mysterious, and you come off that way to others. No one really knows what’s going on inside your head and that’s how you like it. Pluto represents regeneration, renewal, power, obsession and desire for control. 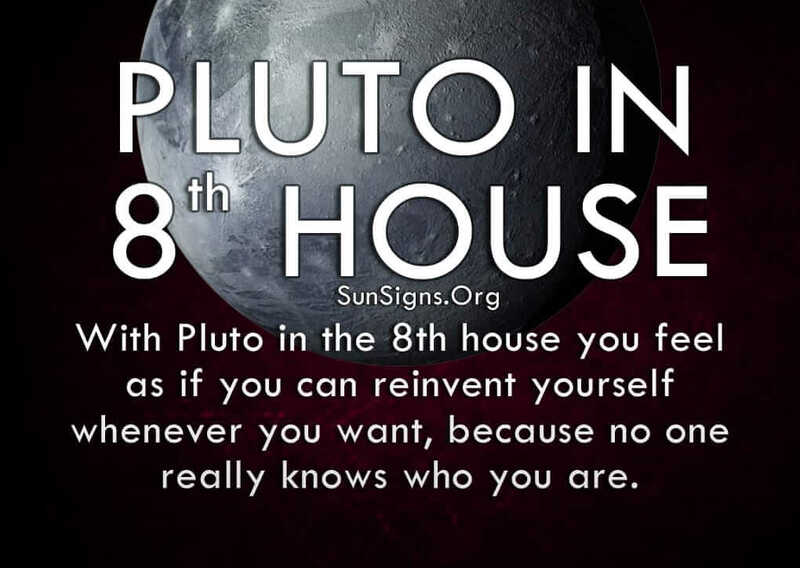 With Pluto in the eighth house you feel as if you can reinvent yourself whenever you want, because no one really knows who you are. And change is important to you, because you are always on the lookout for something deeper and more meaningful. You long for emotional and spiritual growth, so much so that it drives most of your desires and actions. You need life to be extraordinary or else what’s the point? Because of this, you want to be in control of everything going on in your life, so much so that you can become obsessive and possessive. Pluto in eighth house astrology asks you to make sure your partner understands where you’re coming from, and listen to their concerns as well. It’s important to be on the same page before the accusations fly. As much as you want total intimacy, you may also be afraid to give into it for fear of losing that one person. It’s a difficult theme to balance. Try to be more open and honest in your relationships, and you will avoid the chaos you are so fearful of. You have to learn to let go and trust those close to you if you want to experience true intimacy. It will take some time, but soon you will see it feels much better to let loose and be yourself rather than always hiding something. It reduces stress and allows you to have more fun. And getting pleasure out of life can be just as meaningful as anything else. Figure out what makes you happy and go for it. People with Pluto in 8th house, don’t beat around the bush and get down to business, which can be both a good thing and a bad thing. While you don’t take any guff from anyone, you also may dismiss someone as being weak simply because they aren’t as serious or intense as you are. This is also dependent on the Pluto symbolism in astrology. This can seep into your romantic relationships as well, where you don’t accept anyone who isn’t as passionate as you are. Or if you do, it’s because you are better able to control their part in the relationship. Either way you need all of your experiences, sexual included, to be intense and meaningful. (Find out if you are sexually compatible with your lover). You don’t like playing games or being playful. Love is the most intense experience you can have in life, and you want to get anything and everything out of your relationships. While this can be seen as serious and romantic by some, to others it can be alarming or stifling. If you have Pluto in the 8th house, you may also struggle with your partner in other areas such as finances or how to run the household. Again, you feel the need to maintain control over these situations so nothing gets out of hand. You hate having to deal with the mundane details of life. So anything you can do to avoid chaos in these areas you will do it. But you may not always express that to your partner so they have no idea what your motives are for some of your actions.